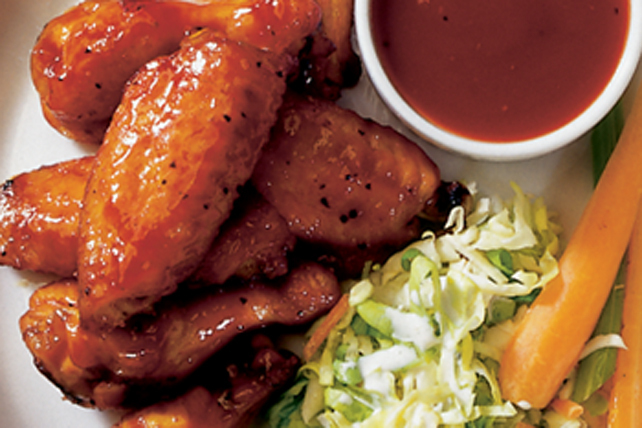 Just 2 ingredients and 5 minutes of prep are needed to get these delicious wings in the oven. It can't get any easier than that! Reserve 1/4 cup barbecue sauce for later use. Toss chicken with remaining barbecue sauce; place on prepared baking sheet. Bake 35 to 40 min. or until chicken is done, turning after 20 min. Serve with reserved barbecue sauce. Serve with carrot and celery sticks. Or, instead serve with a quick coleslaw made by tossing shredded cabbage with your favourite Kraft or Renée's Vinaigrette.